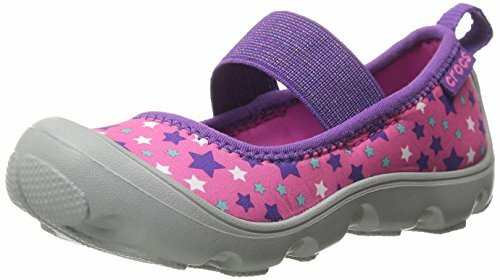 crocs Duet Busy Day Galactic PS Mary Jane (Toddler/Little Kid), Neon Magenta/Light Grey, 8 M US Toddler by Crocs at Blood of The Young. MPN: 201801-676. Hurry! Limited time offer. Offer valid only while supplies last. Stretchy neoprene upper provides a comfortable fit. Star graphic pattern allover. Heel pull-loop for easy entry. Elastic strap for easy on and off. Stretchy neoprene upper provides a comfortable fit. Star graphic pattern allover. Heel pull-loop for easy entry. Elastic strap for easy on and off. Crosliteâ"¢ foam footbed and outsole for cushion and comfort. Durable treaded outsole.